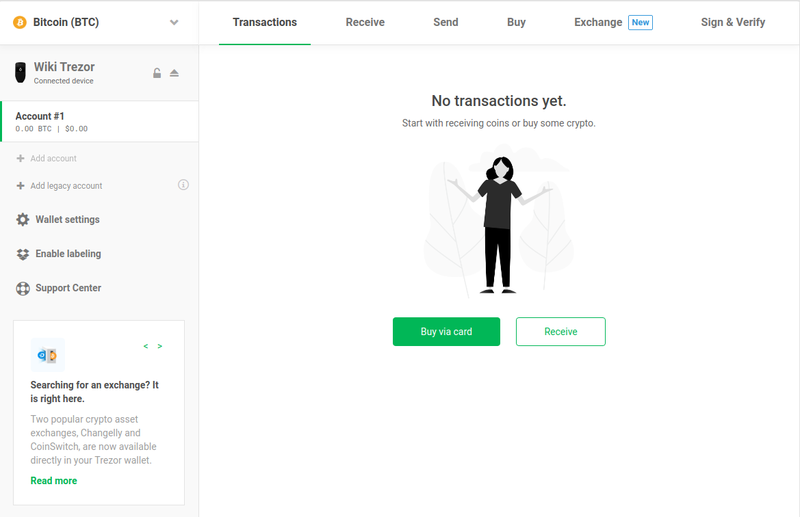 This article contains information about how to use Trezor Wallet to receive payments. This page is for Trezor One (show for Trezor Model T). Once you have initialized your Trezor, your Trezor Wallet is ready to be used. You should now see the home screen with an empty wallet (see the screenshot). By clicking on Account #1, you will see an empty Transactions tab. Now you are ready to receive your first coins. Select the cryptocurrency that you would like to receive in the top left corner of the screen. Trezor Wallet supports Bitcoin, Litecoin, Dash, Zcash, Dogecoin, Vertcoin, Bitcoin Cash and Bitcoin Gold. A number of other cryptocurrencies can be accessed using third-party wallets. For the full list of supported cryptocurrencies, click here. WarningDo not send or receive transactions to addresses generated for a different cryptocurrency, e.g., bitcoin cash to a Bitcoin address. Select the Receive tab to get your first receiving address. Make sure that the receiving address you have provided to someone else has not been changed by the infected computer. The feature Show full address has been developed exactly for this purpose. At this point, you will be asked to check and confirm the address on your Trezor. Always make sure the receiving address created by your Trezor device matches the one in Trezor Wallet. This will make sure that the address is yours and not one generated by a third party. You can always re-check and re-confirm the address on your Trezor device by clicking on the eye icon next to the address in Trezor Wallet. To display the address in the form of a QR code, click on QR code on your Trezor device before confirming the address. The QR code will then be displayed both on your Trezor device and in Trezor Wallet. To display the QR code in your wallet only, confirm the address on your Trezor device. You may also use the Show new address button to generate multiple receiving addresses. This can help you in keeping track of your payments as well as maintaining a high level of privacy. For additional privacy, read also Using multiple accounts. NoteIt is possible to repeatedly reuse any of the receiving addresses generated in your account. Now you can use your newly generated address to receive funds. When someone makes a payment to you, you will see it in your transaction panel. At first, it will appear as unconfirmed. After the transaction gets its first confirmation in the network, you will see the "unconfirmed" text replaced by the time of the confirmation. You can always double-check the status of your transaction in a blockchain explorer by clicking on the confirmation time. You can send your newly received funds even before the first confirmation. However, we strongly recommend waiting until the transaction is confirmed multiple times (three to six confirmations is considered safe). The confirmation time varies based on the transaction fee and the state of the network. This page was last edited on 2 April 2019, at 17:35.